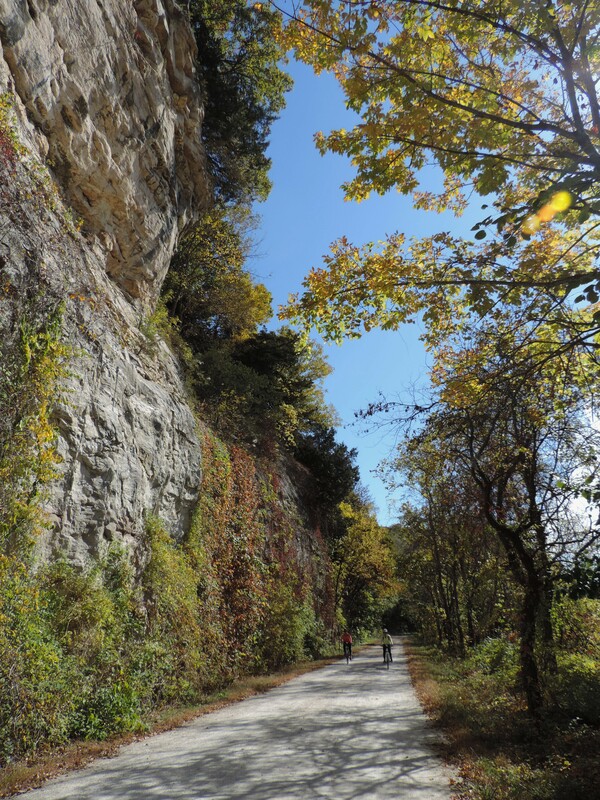 The Katy Trail is a rails-to-trails biking and hiking path that begins in Clinton, MO on the western side of the state, and runs to Machens, MO on the eastern side. It runs along what was once the rail corridor for the Missouri-Kansas-Texas Railroad, commonly known as the Katy. When the railroad decided to abandon the route, the state, over some time, was able to obtain it in bits and pieces, eventually turning it into a first rate biking and hiking trail. 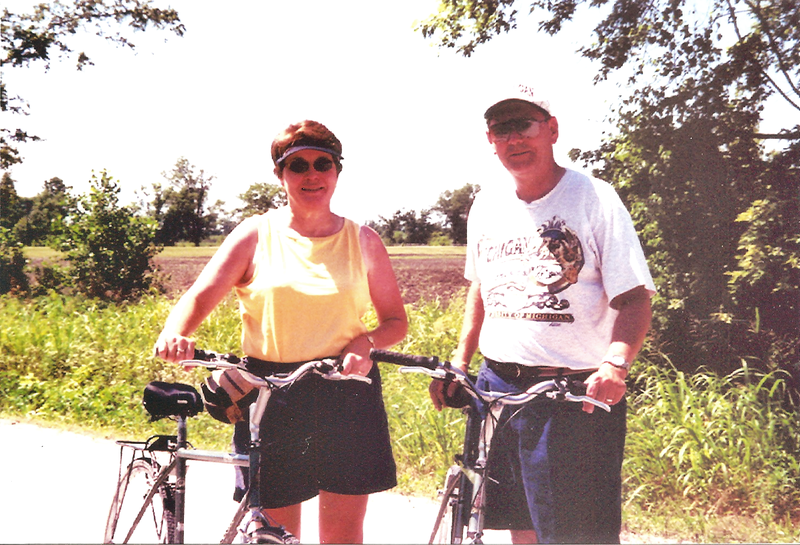 The trail was named Katy Trail State Park, and has been a busy recreational destination for many people ever since. The section of the trail between St. Charles and Boonville has been designated a part of the Lewis and Clark National Historic Trail. 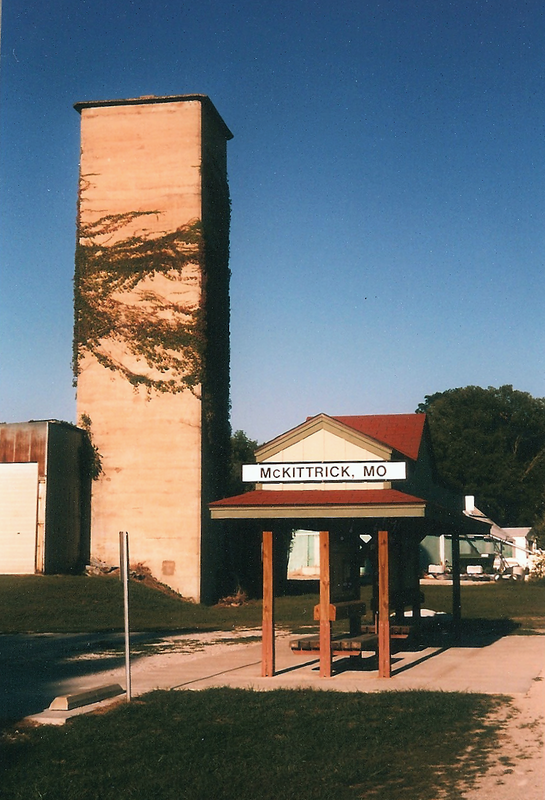 When you travel on the Katy Trail, you will have an opportunity to see many of the features that make Missouri such a beautiful place in the middle of the country. Most of the trail hugs the Missouri River, and those are my favorite places to ride. 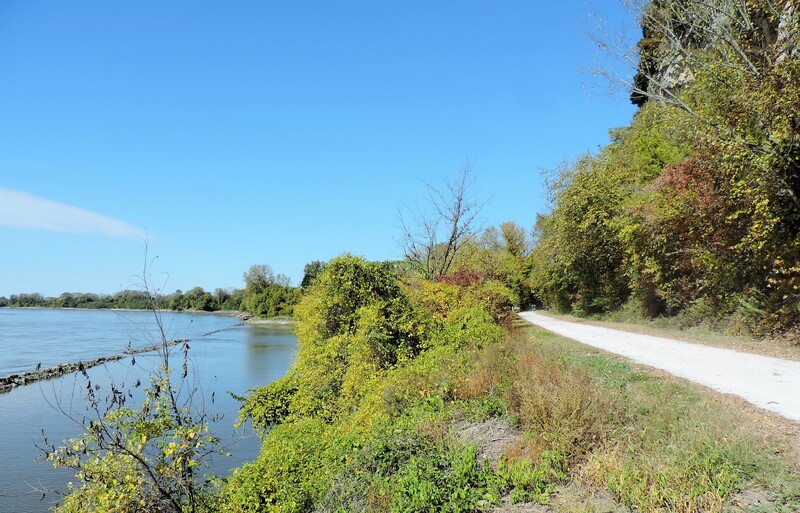 The Katy Trail follows the Missouri River for most of its length. There are twenty-five trail-heads along the trail. At each of these you will find parking spaces, kiosks with maps of the trail and explanations for interesting sites to be seen along that particular section of the trail. Many of the trail-heads are in or near cities. The trail stretches through various landforms within Missouri. In addition to the river, you will see forests, wetlands, prairies, pastureland, and open farmland. Wildlife is abundant in these areas. If you are lucky, you may even see an eagle soar above you, or sitting in a tree. Or, as we did, you might see a cute little skunk run across the trail right if front of you. We stopped, were very still…he went on his way, then we continued on ours! If you ride or hike the trail in different seasons, you will see an ever-changing, always beautiful landscape. Farmland is a part of much of the trail..
Limestone cliffs border the trail along much of its length. There are many historic towns along the trail, and stopping at them will give you an opportunity to explore some of the history of our state. You will travel through the “Missouri Rhineland”, home to early German settlers, through Missouri’s wine country with its many outstanding wineries, cities that were founded before the Civil War, and areas visited by Lewis and Clark as they made their way up the Missouri River. If you are hungry, there are great places to eat. If you are on a long biking or hiking outing, and you are tired, some of the best Bed and Breakfast establishments can be found in the towns and cities along the trail. 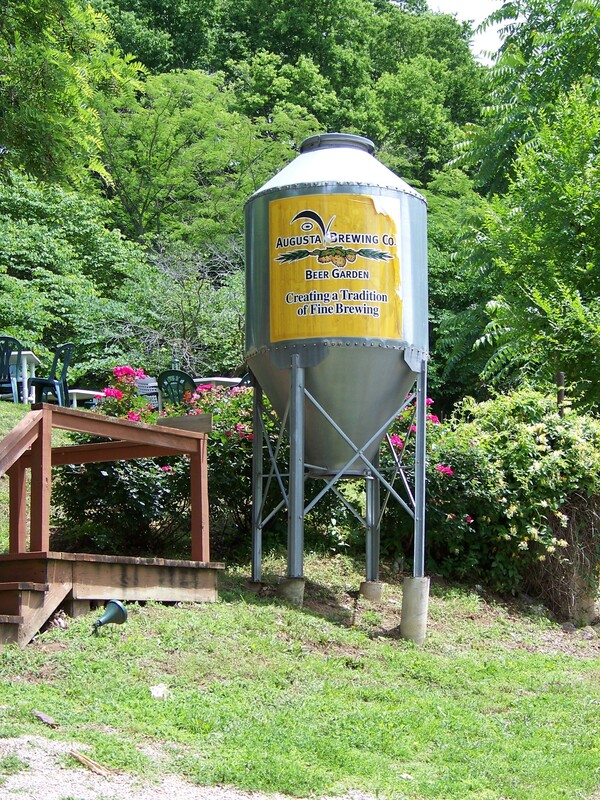 One of our favorite places to eat when we bicycle is the Augusta Brewery which sits on the trail. Augusta is in the wine country, and also has several great wineries. All along the trail you will find relics of days gone by, when early farmers began settling the area, when the railroad was a fixture on the route, and many more. This old building, not too far from Augusta, was used by the railroad as a “filling station” for water and coal. Along the trail, just outside Rocheport, you can see an old emblem identifying the MKT Railroad. This tunnel, in Rocheport, is such a welcome place on a hot summer day in Missouri. I don’t care how hot it gets, and Missouri can get very warm, it is always cool in the tunnel. This cave, near Rocheport, served as storage for explosives that were used by the railroad. Once again, as you venture out, finding your park in this National Park celebration year…come to Missouri, we have a lot to show you. If you live here, come find your park in your own backyard! We love to pick apples in late summer and early autumn here in Missouri. We always pick more than we can eat, and more than we want to make into applesauce. I like to dry some of the apples for healthy snacks. When I take these dried apples on a biking or hiking jaunt, I usually cut them up, and mix them with other healthy items I have on hand, such as nuts, pumpkin seeds, or coconut. The apples can be dried in a commercial dehydrator or in the oven. If you are using a dehydrator, set the temperature to 135 degrees, and dry for 4 to 8 hours. The time will depend on the water content of the apples, as well as the humidity in the room. The apples are done when they feel like raisins and have no visible liquid. They will keep for a while in a plastic bag, but if you want to preserve them longer, put them in the freezer. To dry the apple slices in the oven, preheat the oven to 200 degrees. Place the apples on parchment lined baking sheets in a single layer. Bake in the oven on the upper and lower racks for 1 hour. 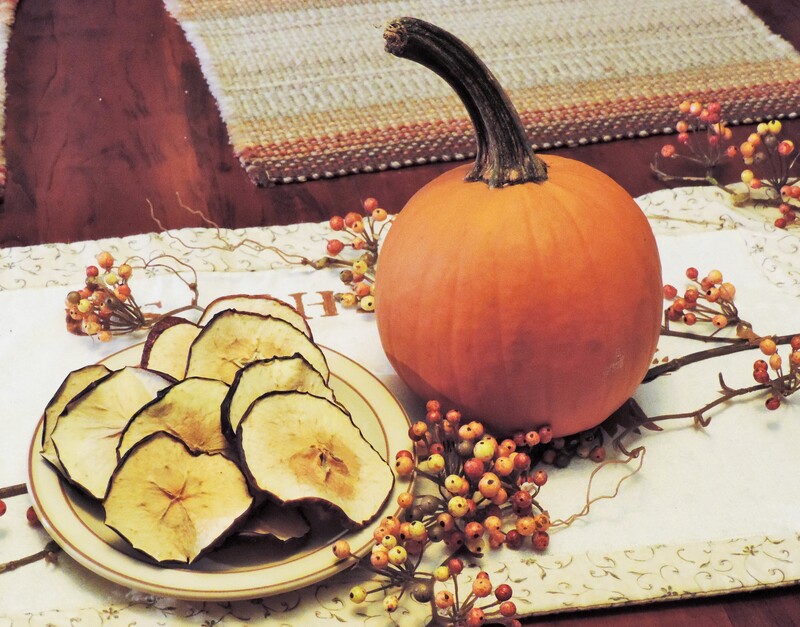 Remove the apples slices, turn them, and return to the oven for 1 to 2 more hours, depending on your preference for soft or crispy apple slices. Turn off the oven, crack the door, and let the apples stay in the oven 1 to 2 hours more. Doors are boundaries we use in our homes. 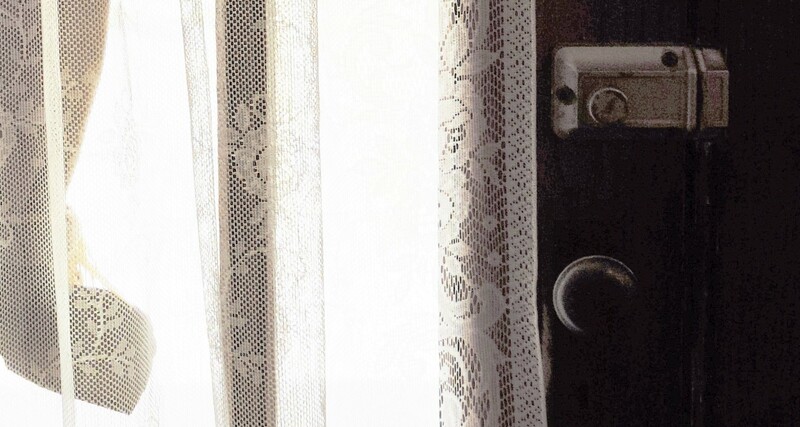 They give privacy to the members of the family living inside, as shown in the featured image at the top of this post. They also put space between the family and the outside world. 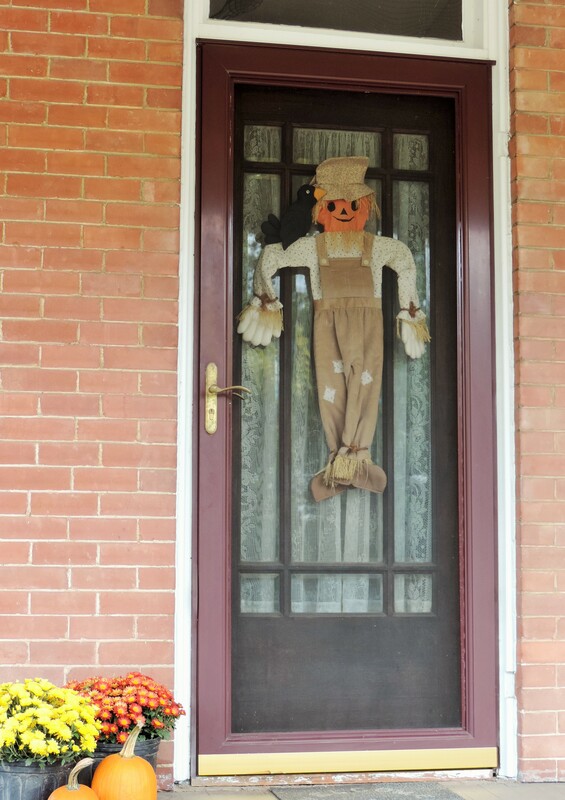 Our front door is a boundary we try to make as welcoming as possible. We invite people to enter, to share with us, and to celebrate with us. But that door has locks on the inside. We also use that door to put a boundary between us and the outside world that cannot be crossed without our permission. Our next stop at sites along the Lewis and Clark National Historic Trail takes us to St. Charles, Missouri. St. Charles is the oldest city on the Missouri River, having been founded in 1769 by Louis Blanchette, a French-Canadian fur trader. When he founded the city, he called it “Les Petites Cotes”, “The Little Hills”. The object of your mission is to explore the Missouri river, & such principal stream of it, as, by it’s course and communication with the waters of the Pacific ocean…may offer the most direct & practicable water communication across this continent for the purpose of commerce. Today, St. Charles is a vibrant city that has managed to retain much of its history and tradition. Main Street is still laid with bricks, and all manner of shops and restaurants line both sides of the street for its entire length. Frontier Park is on the banks of the Missouri River in St. Charles, and is a gathering place for festivals, picnics, and leisurely walks. Sunrise on the Missouri at Frontier Park can be a beautiful site. A statue stands as a tribute to the Corps of Discovery, and to Lewis and Clark, in Frontier Park. St. Charles is in St. Charles County, the first place in Missouri to see the sun rise each morning. But… back to the Boat House! The first thing you will notice as you approach the building is the large first floor space enclosed in iron bars. This is where the reconstructed boats of the Expedition are kept: the keel boat and two pirogues. The keel boat is 55 feet long and has a carrying capacity of twelve to fourteen tons. The boats at the Boat House are the boats you will see in an upcoming mini-series about the Lewis and Clark Expedition being filmed by HBO. The reconstructed keel boat and the two pirogues are stored on the ground level of the Boat House when not in use on the river. In 2006, my husband and I took our classes to Frontier Park to see the “corps” of new explorers as they returned from recreating the famous journey of the Corps of Discovery. From viewing the boats, you will climb the stairs to the museum and the museum store. Inside the museum are displays relating to the Corps of Discovery and the city of St. Charles. 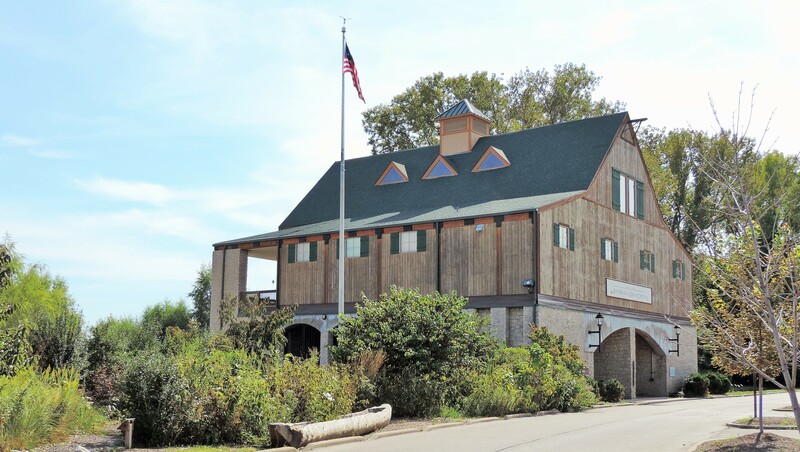 The museum is full of interesting information about the Lewis and Clark Expedition, as well as information about early St. Charles and the Missouri River. A half scale model of St. Borromeo Church reminds us of the original parish church built in Les Petites Cotes and dedicated in 1791. When you walk through the doors of the parish model, you enter a room in which to view films, see demonstrations, and hold educational activities…a truly magical place. Today, St. Borromeo is a thriving parish with a school which serves many children in the city of St. Charles. As you enter the museum, you can pick up a guide full of questions. As you tour the museum looking for the answers to the questions…I call it an information scavenger hunt…you will learn about the Corps of Discovery through interactive activities, models, murals, displays and dioramas. These half models of buildings in St. Charles introduce visitors to life in the city as it developed. You will find this bull boat in the museum, along with displays on weather, the river, and geology. One of my students’ favorite displays was the nature display. The display, consisting of a beaver pond, a bubbling spring, a prairie, and a hillside cutaway, helps visitors learn about the plants and animals that were encountered by the Corps. And, of course, there is a museum store. The Trading Post at The Boat House is full of many items pertaining to the Lewis and Clark Expedition to tempt both children and adults. I almost never get out of there without something, especially if I spend any time at all in the book section. As we left the museum and the boats behind, we took a little time to walk through the garden in front of the building. The gardens highlight those plants that grow and thrive in a flood plain. A sign in the garden explains that many of the plants have roots that go six to ten feet down into the soil, and that many of the plants have survived three floods and a drought. You will also see an old canoe hollowed out from one large tree trunk. One of my favorite things outside the museum are the numerous pieces of driftwood. The Missouri River carries a lot of sediment as it flows through the western American continent to join the Mississippi River not far from St. Charles. The pieces of wood which come down with this sediment are broken down and smoothed to form, what I think are, pieces of art made by nature itself. The garden on the riverbank with tall, fast growing plants. A cup sunflower in the riverside garden. An old canoe hollowed out of the trunk of a single tree. all the driftwood everywhere along the riverbank. When the Corps of Discovery left on their epic journey, they carried with them 3,705 pounds of pork, more than any other commodity. It was their go-to item on those days when the men sent out to hunt dinner came back empty-handed. This stew may have been a second choice, but it is really good. My husband and I eat it often as a “first choice”. Place the pork in a plastic bag with the cornmeal, salt, and pepper. Shake the bag until all the pork is covered in the cornmeal mixture. Heat the oil in a Dutch oven at medium-high heat. Lightly brown the pork on all sides. Add the onions and cook until they soften, stirring often. This will take between 8 and 10 minutes, and you may need to reduce the heat a bit to keep the onions from burning. Add the beef broth and simmer over medium-low heat for about an hour. This stew tastes best if you refrigerate it overnight. When it is dinner time, just skim the fat from the top and heat for at least 20 minutes, stirring often. Do not allow the bottom to burn. 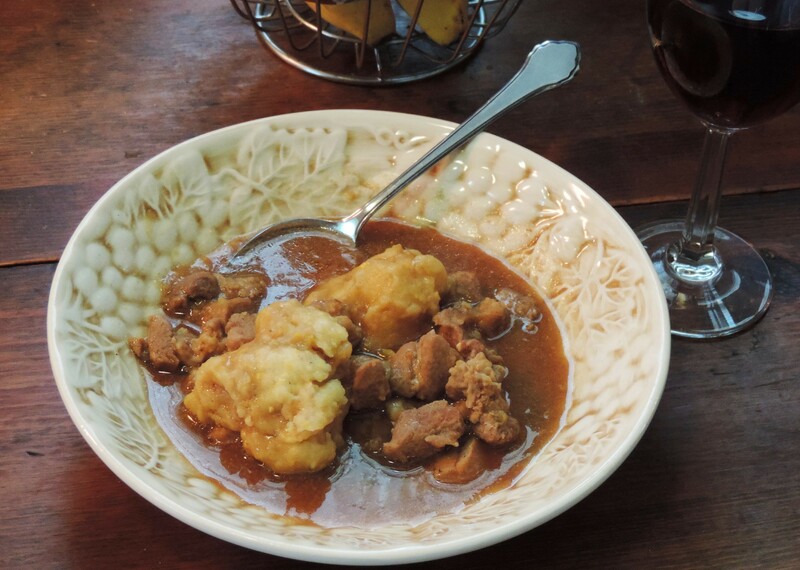 While the stew is heating, prepare the dumplings. Mix the flour, cornmeal, baking powder, and salt. Stir in 1/3 cup of water and the melted butter, just until moistened. *This recipe was adapted from The Food Journal of Lewis & Clark: Recipes for an Expedition, by Mary Gunderson. It was published in 2003 by History Cooks in Yankton, SD.